If you’ve been putting off treating your varicose veins, the best time to act is now. With summer moving behind us, now is the ideal time of year to say goodbye to unsightly veins. Since wearing compression stockings is often required for the healing process, many patients are hesitant to undergo procedures during the hot summer months. The good news is that since they can easily be worn under jeans or pants, you can treat your vascular issues without anyone being the wiser. Another perk to beginning your procedures in the fall? By the time summer rolls around again, your legs will be beach ready! In addition to wearing compression stockings, it’s important to rest up after undergoing vein treatment. As the weather cools down, it makes for an optimal time to do so. While the cosmetic benefits alone can’t be understated, these treatments also pack a serious health punch. If left untreated, circulation issues can cause relentless cramping, heaviness in the legs and more — including dangerous ulcers, infections and blood clots. Taking the time to address them can be a life changer.Contact Dr. Robert Merchant and Dr. John Daake of the Reno Vein Clinic for a consultation to see if your veins can be treated this autumn. A thoracic aortic aneurysm, say that five times fast, is a weakened and bulging area in the upper part of the aorta, which is the major vessel that feeds blood to the body from the heart. Depending on the size and growth rate of the aneurysm, treatment may vary from watchful waiting to emergency surgery. Thoracic aortic aneurysms often grow slowly and without symptoms, making them difficult to detect. Some people may notice pain or tenderness in the abdomen, chest or back. The exact causes of thoracic aortic aneurysms are unknown, but contributing factors include hereditary conditions, connective tissue disease, heart valve failures and problems, and traumatic injury. While there is not a medicine you can take to prevent these aneurysms, there are risk factors you can be aware of. Risk factors include age, tobacco use, high blood pressure, plaque build up in the arteries and genetic predisposition. Males are also more likely to develop a thoracic aortic aneurysm than women and more Caucasians are diagnosed with these aneurysms than any other race. Doctors are able to diagnose thoracic aortic aneurysms through chest x-rays, echocardiograms, CT scans and MRA’s. If you think you may have an aortic aneurysm or have experienced any of the symptoms, see your doctor immediately. For more information about vascular health contact one of the doctors at the Reno Vein Clinic at (775) 329-3100 or visit www.renoveinclinic.com. 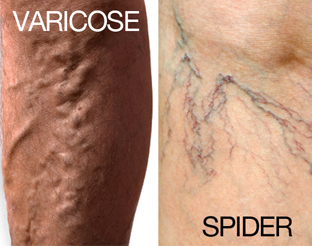 Is it a varicose vein or a spider vein? We get these questions often, as sometimes both of the conditions get confused for one another. Spider veins are generally tiny blood vessels just below the skin’s surface that become dilated; because they’re so close to the surface of the skin, they can be seen easily. Clusters of spider veins may appear to be a bruise. Spider veins can form due to heredity, injury, pregnancy, or hormonal changes. These veins are not usually harmful, but in rare cases they can bleed and lead to more serious conditions. Varicose veins are more painful and more noticeable. If varicose veins are close enough to the surface of the skin, they appear ropey, gnarled, and reddish or purple. Varicose veins can lead to more serious issues such as blood clots, and can signal a higher risk of other circulatory problems.